Gematsu speaks to Hiroshi Matsuyama at Comic-Con. We spoke to CyberConnect2 president and CEO Hiroshi Matsuyama during Comic-Con in New York yesterday, where we discussed the developer’s upcoming Naruto Shippuden: Ultimate Ninja Storm 3 and JoJo’s Bizarre Adventure, the studio in general, and more. Find our full transcript below. — Hello, Matsuyama-san. I’d like to start off with Naruto Shippuden: Ultimate Ninja Storm 3. What sort of changes are being made to online battles? Matsuyama: Unfortunately, we are not able to release details about the online mode at this time. But we are making upgrades to every mode in the game, and we hope that the online mode will be a mode will allow players to continue playing even completing the story mode. — Would you say that these are substantial upgrades? Matsuyama: Hmm. The foundation of the online mode is very similar to what you’ve seen before, but there will be upgrades both systematically and on the technical side. — Will older characters, those who’ve appeared in Naruto: Ultimate Ninja Storm 1 and so forth, gain any new content in terms of moves or costumes? 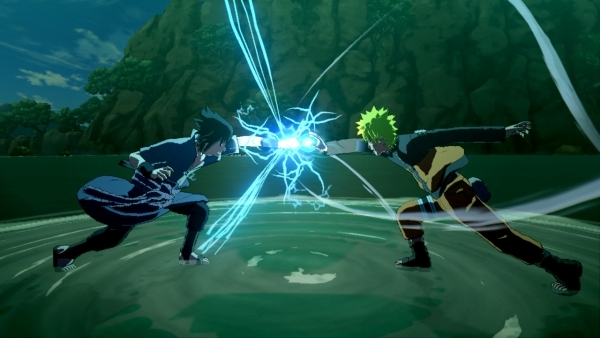 Matsuyama: There won’t be any new moves, per say, but because of the new system that we have for battles in Ultimate Ninja Storm 3, we hope that players will be able to see that there’s are new impressions and ways to use these old characters. — “What if” scenarios have been a fun thing to experience in recent anime games, such as Dragon Ball Z. Is CyberConnect2 considering these types of alternate storylines for Ultimate Ninja Storm 3? Matsuyama: Yes. In addition to the main scenario for Ultimate Ninja Storm 3, there will be sub-scenarios, which do have a little bit of this “what if” mode that you’re familiar with, and something that we are certainly putting into Storm 3. — Is there a certain scenario that you’d like to see happen in Naruto, which you’re trying to put into the game? Matsuyama: Yes. But unfortunately, I cannot describe it at this time. — First, let me apologize, as I’m not very knowledgeable on the Naruto series, myself. So, please tell me, why should Naruto fans look forward to Ultimate Ninja Storm 3? Matsuyama: The first point is: this is the first installment of the Naruto: Ultimate Ninja Storm series, and so everything that you’ve seen up to this point has been polished even more and improved. And we hope fans continue to look forward to this game because it will provide the largest amount of gameplay in terms of number of playable characters and covering up to the latest episodes in the story mode. — Just to be clear, up to what episode does the story cover? Surely, new episodes are being released as the game is developed, no? Matsuyama: The story mode covers up until the Great Ninja War. It starts right after Ultimate Ninja Storm 2 ends, but technically speaking, it starts 16 years before the whole story even begins, when the Nine Tails attacks the village of Konoha. — Will the game include any digest movies? How would someone like me, who doesn’t know much about the story, pick up the game and understand what’s going on? Matsuyama: This game is created to allow people who have no prior knowledge of Naruto to pick up the game and be able to play with full knowledge of what’s going on. — What types of gameplay modes can we expect? The story mode will be new, and will have a lot of different kinds of modes that will provide a variety of gameplay. For example, there will be an adventure mode, a battle mode, and there will be boss battles against very, very massive, large bosses, as well as a one-versus-many type of battle mode. — In these massive boss battles, are you utilizing a lot of on-screen prompts? Or is the player always in control? Matsuyama: Long answer short, there will be both the quick-time events that you are talking about, as well as the player physically fighting against these massive bosses. — What new battle elements have been added to Ultimate Ninja Storm 3? Matsuyama: There have been many upgrades made in Ultimate Ninja Storm 3 since its previous installments, Ultimate Ninja Storm 2 and Ultimate Ninja Storm Generations. For example, for one, a selected amount of characters are able to Awaken at any moment, which was not a feature included in previous installments. — How does the future look for a new .hack RPG? Matsuyama: Actually, this week in Japan, there will be a new .hack title for the smartphone called Guilty Dragon. It’s an RPG. — Are there plans to bring Guilty Dragon stateside? Matsuyama: Yes, there are plans, but the release date or the release period has not been determined. Matsuyama: Unfortunately for .hack//Versus, there are no plans, at the moment, to release it in American territories. Matsuyama: Unfortunately, because the movie is packed with the game as a hybrid disc, there are also no plans for it. — A lot of fans have been asking for a high-definition collection of G.U. or the original .hack. Has there been any consideration for that? Matsuyama: (Laughs.) There are no plans for an sort of high-definition remaking right now, unfortunately. But if we receive a lot of fan feedback to either CyberConnect 2 or Namco Bandai Games, then we can make it happen. — How many characters are you planning to include in JoJo’s Bizarre Adventure? Matsuyama: We can’t say how many characters are being created right now, but there are eight characters who’ve been revealed up to this point, but we will continue to reveal more characters, so please stay tuned! — I know the Naruto games have a rather large roster. In comparison, are you aiming for a large, medium, or small selection? Matsuyama: I would love to have as many characters as Ultimate Ninja Storm 3 in JoJo’s Bizarre Adventure. But I’ve been working on the Naruto games for over ten years, as opposed to JoJo, which is the first title. So it’s not really feasible to put that many characters in. But as the first JoJo title, I think it’s a lot. — Recently, a trademark for “All Star Battle” appeared in the U.S. trademark database, which, as you know, is the subtitle for your upcoming JoJo game. Given that, does Namco Bandai have plans to localize the game? Matsuyama: Right now, we are looking into a North American and European release. But we’re still investigating. (in excitement) Do you know JoJo? Matsuyama: Ah. Did you see the trailer released in Japan? Yes, it looks pretty nutty! Matsuyama: But you don’t know much about the JoJo series? Matsuyama: (Laughs.) Thank you very much! — You’ve worked on Naruto and you’ve worked on JoJo. What anime would you like to work on that you haven’t already? Matsuyama: I’m not really thinking about any other series right now. I’m fully concentrated on Naruto and JoJo. — Where would CyberConnect2 like to see itself as a company in five years? Matsuyama: My hopes aren’t very different from what CyberConnect2 is aiming to do right now. And that’s to provide games that only CyberConnect2 can make. Games that have a CyberConnect2 kinda flavor to it. And games that players will still want to play. The number of studios might increase, though. — CyberConnect2 has established itself as the ‘Naruto and .hack, and a little bit on the side’ studio. Is this an image you’re happy with? Or would you rather the studio widen in terms of what you develop? Matsuyama: Of course, we’re always trying to challenge ourselves and make new titles. For example, Asura’s Wrath with Capcom. And we are continuously trying to make new titles. — On the subject of Asura’s Wrath, many a fan has been asking for Asura’s Wrath 2. Is that something you’re considering? Matsuyama: We have received a lot of fan feedback like that, and from the studios, as well. We are aware of this and are thinking very positively, and are investigating if this is possible. — Do you have any closing statements for the fans? Matsuyama: Yes. With Ultimate Ninja Storm 3, the Ultimate Ninja Storm series will have sold 100 million copies worldwide. So we’re very excited to keep the fans involved in the series.